Mulberry silkworms have been cultivated in China for nearly 5000 years by professional silkworm keepers of the Imperial Court on trays of mulberry leaves. There is an important difference in origin and structure between wool or hair on the one hand and silk on the other. Wool and hair are formed of the protein ‘keratin’ and grow either continuously or seasonally from the outer dermis or skin layer of mammals such as sheep and goats. Silk is a different protein ‘fibroin’ that is produced on demand from special silk glands of several different groups of invertebrate animals including silk moths and is extruded through openings called spinnerets in a process similar to the production of rayon. Spiders use this silk to spin a spider’s web, silkworms spin a protective cocoon for the vulnerable pupa stage. Silk is produced by many insects and by spiders but commercial silk comes from caterpillars (larvae or silkworms) of silk moths of the superfamily Bombycoidea. Several different groups of silk moths are currently used to produce wild silk but cultivated silk from larvae of the Mulberry Silkworm moth, Bombyx mori, accounts for most commercial production. Bombyx mori appears to be descended from the wild silk moth Bombyx mandarina which is very widely distributed in China and Japan, also feeds on mulberry of which it considered a pest, and which crosses readily with B. mori (Aruga, 1994). The female moth is short-lived and produces about 500 eggs in 4-5 days before dying. Like almost all members of this group, it has no proboscis and does not feed. The larva, however, feeds voraciously on mulberry leaves for about 35 days before reaching full size, in optimum conditions of temperature and food quality. It then spins a silk cocoon so that it is protected whilst changing into an immobile pupa stage and then developing to an adult moth inside the pupa. The silk is produced as a thick sticky liquid through the openings of two spinnerets under the mouth and solidifies in the air to form twin filaments of silk that are glued together into a single thread with sericin. Up to a thousand metres of this silk fibre may be produced in a three day period. The pupae are generally killed by dropping the cocoons into boiling water which also dissolves the sericin coating and frees the fibre. Tussah silk is a textured wild silk produced by wild silk worms living naturally in tropical or semi-tropical forests in China and India and the cocoons are gathered after the moth emerges. The silk is beige to brownish toned possibly due to tannin from the variety of trees eaten by the caterpillars. The typical honey colour may be produced where the larvae feed on oak leaves. Read more about Tussah Silk and Tussah Silkmoths here (open new page). Dupion, habotai and noil are qualities of silk. 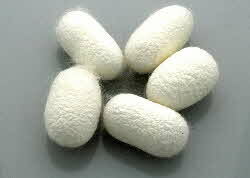 Dupion is an irregular, rough silk that occurs when two silk worms spin cocoons side-by-side. This results in interlocked fibres, making it necessary to reel them together, and produces a slub that gives the finished fabric a textured effect and reflective lustre. 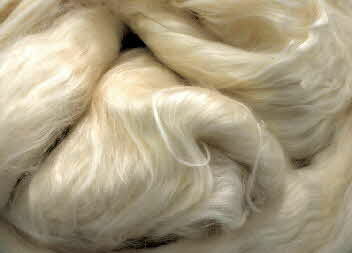 Dupion is the most widely known silk and is often used for wedding dresses etc. Habotai means soft as down or soft as a feather in Japanese and is a medium weight, ivory Chinese silk that is used for silk painting and for scarves or cushions. 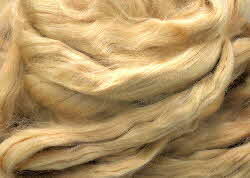 Noil is the short fibre left over from combing wool or spinning silk. As noil is a shorter fibre, fabric made from noil is weaker and considered less valuable. The cocoons are soaked in warm, soapy water and stretched over a frame that is square (approx 25 cm square) for hankies. Caps are stretched over a bamboo framework that is shaped like a knitted cap. Several cocoons are stretched over the frame so that each hankie or cap is composed of several layers, each containing the silk fibres of one cocoon. Mawata is Japanese for ‘spread out’ and refers to the expansion of the cocoon. For more on Mawata, see Wormspit’s page on Mawata and Llyn Payne’s article.